Clarence House has revealed the route that the Royal Couple will take to and from the Wedding Ceremony as well as the vehicles that will be used. One of the highlights of the Celebrations will be the ride in a State Landau, that was specifically built for King Edward VII in 1902. It has been used before by Charles and Diana, and many other Royals, over the years. For the separate arrival of Miss Middleton and Prince William at Westminster Abbey, two classic cars will be used. Miss Middleton will arrive together with her father in a Rolls Royce Phantom VI, a car that recently made headlines, when Prince Charles and Camilla Parker-Bowles were attacked by rioters in December. After the Church Ceremony, the newly weds will depart in a horse-drawn, open-topped 1902 State Landau carriage. It which will travel along a carefully planned processional route back to Buckingham Palace. Thousands of bystanders are expected to cheer when William and Kate will make their first appearance as a married couple. 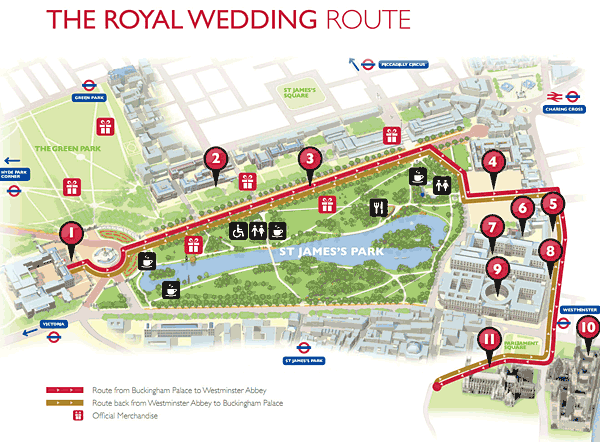 Royal Parks has released the Processional Route, it runs from Westminster Abbey to Parliament Square and then on to Whitehall, Horse Guards Parade before The Mall to the Palace. Click here for an Interactive Map by Royal Parks. Will you be there on April 29? This was written by admin. Posted on Wednesday, March 23, 2011, at 7:02 am. Filed under Wedding. Tagged Buckingham Palace, London, Procession, Rolls Royce, Route, State Landau. Bookmark the permalink. Follow comments here with the RSS feed. Both comments and trackbacks are currently closed. Waitings for that day)) Our congretulations!!! Love, live and Laugh enjoy everyday of your lives you will share.